This week the United States federal government experienced a three day impasse over the budget, effectively shutting down America’s government. Conceptually you can imagine government offices closing but in the digital age surely the online channel would remain on. Or would it? During the sixteen day long shutdown of 2013 countless websites closed their virtual doors. Pages were not accessible and often redirected to a message saying due to federal shutdown the website was unavailable. Not only does that send a terrible message to customers - after all in almost all circumstances there was no budgetary need to shutdown web sites - it sent a massive red flag to someone with a more impactful memory: Google. If you’re like most people you automatically turn to Google to answer your questions. And from leading a government website you’re probably also very much aware how much traffic Google sends your way. When you put these two things together: customer demand and government providing an authoritative and trustworthy supply of content, Google will send thousands if not millions of online customers your way. But when Google’s bots headed off in October 2013 to crawl those authoritative government sites they found plenty of a virtual doors slammed in their face. And while many of us know that Google uses over 200 different elements in its search ranking algorithm one of the key things they look for is availability. Being 100% available demonstrates stability and again trustworthiness. Normally government websites have this trait coming out of their ears, but during the shutdown Google’s bots instantly sidelined countless government websites from their index. In doing so internet users needed to look elsewhere for their answers. And it took a while for those government sites to re-earn Google’s trust as being a stable authoritative source. Depending on how each shutdown government website was configured it had different impacts on how quickly they regained their reputation with Google. At the time Vanessa Fox wrote in Search Engine Land a great article on how to approach 200, 301, 302 and 503 redirects and responses. Depending on which way a shutdown site approached things, the quicker they’d rebound. Similar principles apply when you’re redeveloping a government website and URLs change. I’m aware of two government sites which didn’t approach things right. One struck it lucky and by making only small mistakes instead of larger ones took three months to reclaim their position in Google search engine rankings and traffic. The other took 18 months. So whether you’re approaching a government shutdown or just a large redevelopment it’s imperative you get things right if you don’t want to lose a large chunk of your customer base. So what happened with the 2018 shutdown and government websites? It seems that many US federal government agencies learnt the lesson from 2013. Only a handful were publicly identified as shutting up shop including sections of the National Oceanic and Atmospheric Administration, the National Science Foundation and Data.gov. Just as the cloud of uncertainty lifted in Washington DC, I did a quick investigation into how various US federal government websites were tracking. Sites like the Small Business Agency carried an alert in a ribbon at the top of their pages alerting customers to the shutdown and disruption of some services. But the US Government’s site to small businesses otherwise was fully operational. But what about the Google impact? While SBA.gov may have been up and running other US federal government sites for business must have been clearly gone dark. You can check the impact of the shutdown on traffic to your own Government to Business website by getting your analytics team to do a little digging. 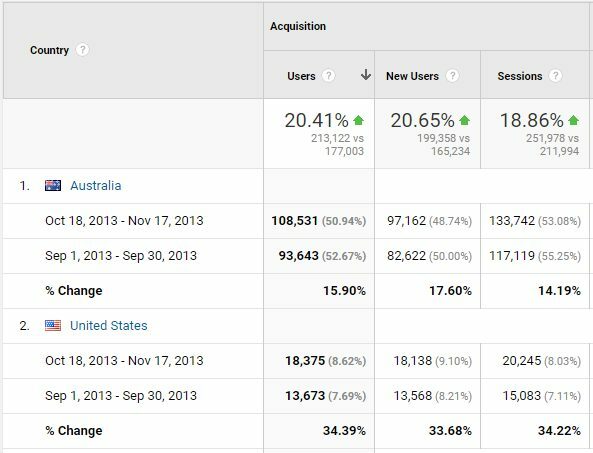 As an example here is the traffic of an Australian based government website for business. 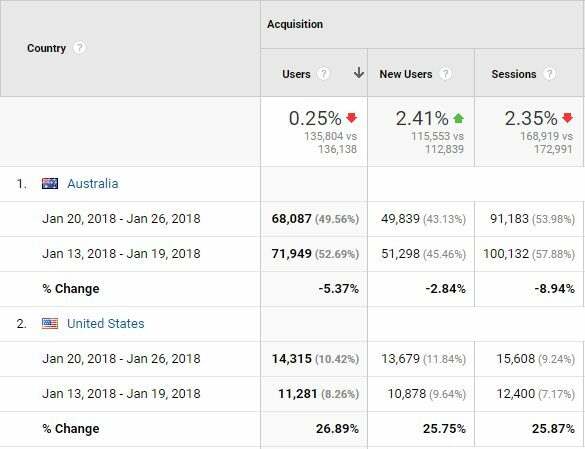 Now understandably its primary audience is always going to be from Australia, but check out the jump in traffic from the United States. Comparing the week before the shutdown to the week of the shutdown, American traffic had a massive uptick of almost 27% while local traffic actually fell over 5%. That’s just from three days of virtual static from some US Government websites to business. The big question is what happened from almost three weeks of this in 2013? Here you can clearly see the staying power and impact of the shutdown with American traffic still growing almost a full 20% greater than local volumes increased and achieving an overall boost of 34%. If your government’s political system can result in jolting effects to the budget cycle its imperative that you have in your business continuity planning a clear set of actions to maintain digital continuity. 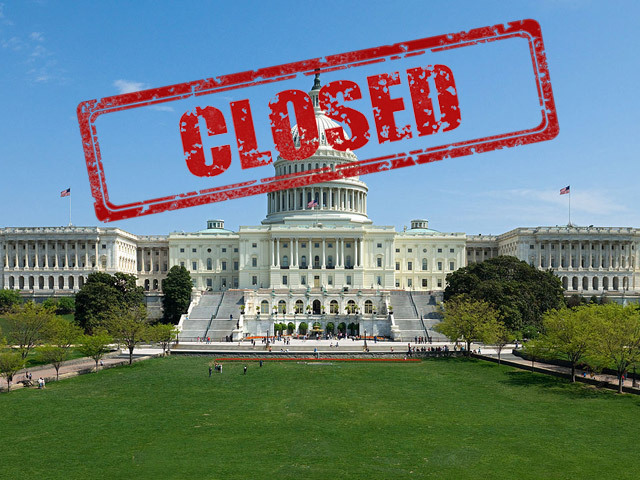 Failure to do so will not only mean a horrendous experience for your jurisdiction’s business customers, it can have an ongoing impact long past the shutdown. So take steps now to ensure you don’t cop a bullet from Google. If you wait too long, it may be too late.